Nowadays, most businesses are well aware of the marketing potential of Facebook and have at least a Facebook business page started there. Considering that there are nearly a billion members on Facebook, the potential reach of the social site is absolutely staggering on a local, national and international scale. Still, you can’t just post a bare bones Facebook business page and then just sit back and wait for your business to become viral. In fact, as with any other marketing modality, there’s an art to making social media work for your brand – and it’s not as simple as painting by the numbers. We’ve gone over many of the most important things you must do in order to make your social media presence great – now, let’s take a look at what not to do. We’re all busy, time-strapped, cash-strapped – we get it. However, if you’re going to enter the Facebook marketplace with the expectation that current and prospective customers will follow you, make sure you carve out the time necessary to create a full and captivating Facebook business profile. Too many brands make the mistake of merely posting one photo, a quick sentence or two about their business and maybe a website link. A smart social media presence will take advantage of all of the bells and whistles Facebook has to offer. If you have multiple brands to maintain, create separate pages for each and link to them from the main page. Be sure to post a number of photos, albums even, dedicated to different aspects of your business. Integrate your business’ Twitter profile in order to help increase buzz between the two social networking sites. Make sure your business page has all of the pertinent information one would expect from your regular website as well, including hours, services, contact information, your address and all the rest. Facebook might be the first place a prospective customer learns about your brand – and it might be the only chance you get to snag them – so make sure they know all they’ll need to know in order to take the next step. Your page’s cover photo is one of your best chances to make a great first impression – however, it’s also a potential pitfall. For starters, when you join Facebook as a brand, take a moment to read their policy on photos – especially cover photos. Many brands have no idea that Facebook’s guidelines don’t allow for cover photos that include pricing or purchasing information (ie: coupon codes, discounts, sales banners or flyers), any sort of suggestion to act (ie: “like us now”, “share this with friends”, “leave us your feedback”, etc.) or business contact information. Make sure your cover photo is an alluring visualization of your brand – be it a glamour photo of a product or a brand ambassador – and make sure you change it up periodically to keep things fresh and interesting for long-time fans of your brand. 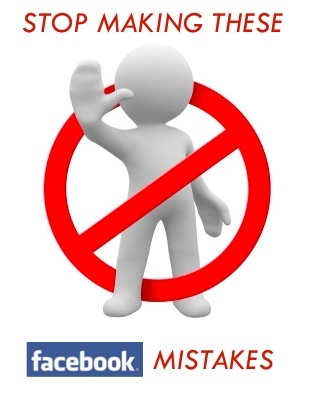 So many brands make the mistake of setting up their Facebook business page and never revisiting it. This is a huge mistake for a number of reasons. For starters, because Facebook is now in the ‘Timeline’ format, it’s a far more visual media than ever before and it begs to be refreshed on a regular basis. Second, Facebook is an amazing opportunity to interact with customers and clients. From the wall, to Q&As and polling, to contests and more – there are so many amazing ways to cultivate a community around your brand and they’re easy and often not all that time consuming to achieve. Make Facebook a priority and carve out a certain amount of time for it on at least a weekly if not daily basis, and you’ll reap the rewards in no time. If you’re itching to learn more about Facebook Marketing for your business and happen to be in the Greater Phoenix, Arizona, check out our next LIVE Facebook Marketing Training.